One of A.R. Gurney's lesser known works, Ancestral Voices, is getting a run over at Music Theatre of Connecticut, where the intimate setting is just right for the nostalgic look at one family, seen through the eyes of a boy growing up in Buffalo before World War II. Staged in a reading format and directed by Kevin Connors, some of the ensemble actors play multiple roles on a simple set containing a couch, some chairs and a couple of music stands in front of a proscenium backdrop (Eric Zoback, design). We almost feel as though we've pulled up a chair at a family gathering where members are sitting around saying, "remember when..."
Eddie (Michael McGurk) recalls a Sunday visit to his grandmother's house. 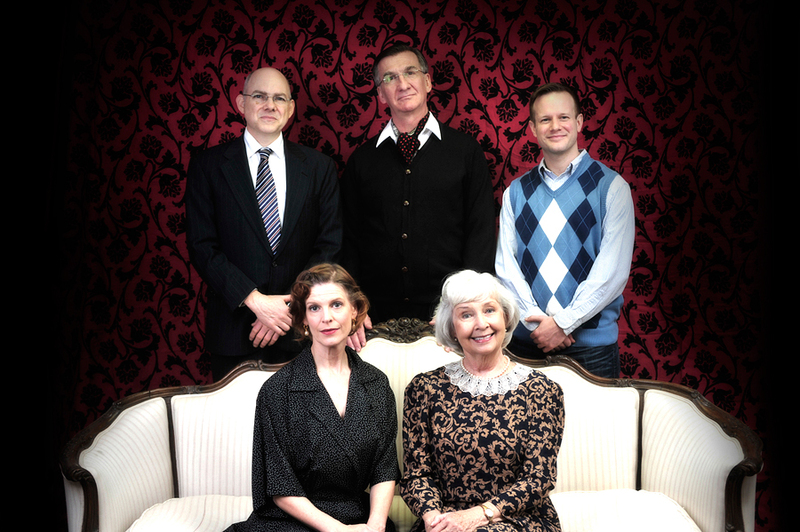 It is the first visit since Madeline (Jo Ann Parady) and his beloved Grandpa Ed (John Little) have separated. Eddie and his mom, Jane (Marty Bongfeldt) aren't too happy about the installation Jack (also Little), Grandpa's former best friend and Grandma's new husband into the family, but Eddie's dad, Harvey (John Flaherty), tries to give him the benefit of the doubt. Over the years, the family's ties to the community and their commitment to each other change and grow as various memories are shared and the relationships among the members play out (In a fun turn, Parady doubles as a Southern belle who dates Grandpa for a bit too). In pre-war Buffalo society, Madeline is a virtual outcast following her divorce. It's also a time when Eddie and his grandfather can get away from everything and enjoy hunting and fishing trips in peace up on Big Rock Mountain -- until news reports start feature a guy named Hitler and an attack on Pearl Harbor. It's a blend of nostalgia and issues about family, love and acceptance that ring just as true in contemporary times.. Gurney's script is well written and contains some quiet humor. It is more like Love Letters than Sylvia (in which one of the characters is a dog) for those of you interested in levels of humor. This gem of a production has a strong cast and able direction which allow us to bond and feel some of the ancestral voices are our own. Flaherty in particular gives a layered portrayal of a man who knows how to play "father" and keep up appearances in public, but whose cutting remarks betray an underlying disappointment and the lack of affection he feels for Eddie. The play runs Fridays and Saturdays at 8 pm, Saturdays at 4 pm and Sundays at 3 pm through Feb. 17 at Music Theatre of Connecticut, 246 Post Road, Westport (lower level). Tickets are $25-$45 with discounts for seniors and students. www.musictheatreofct.com; 203-454-3883.